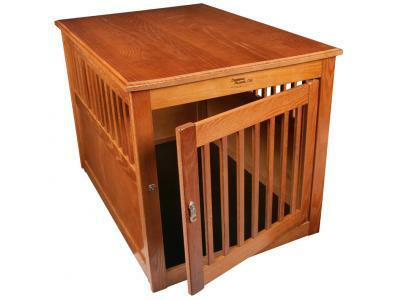 The Dynamic Accents Wood Furniture End Table Dog Crate offers dog owners a handcrafted, furniture quality wooden dog crate alternative to unsightly wire dog crates! 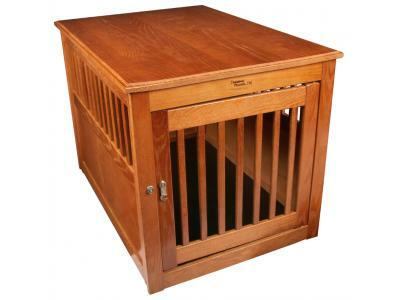 These designer inspired hard wood dog crates are constructed with durable oak wood, and function as both a living room furniture end table, a bed room night stand, and a highly durable designer dog crate. 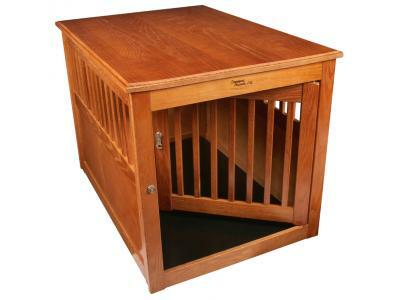 Dynamic Accents has designed these hardwood dog crates to accommodate standard Midwest dog crate beds, pads, and cushions making it extermely affordable to add both simplicity and elegance to your home. Superior quality, handcrafted in the U.S.A.
Swing-through door that can be fastened shut with the fashionable and secure closure, or rotated inside the crate to provide open access for your pet. Roomy interior dimensions are 26'' H x 24'' W x 36'' D to easily accommodate most medium to large size pets. Note: This wooden dog crate is not recommended for puppies or dogs that like to chew.